The Harward Center for Community Partnerships at Bates holds its annual community celebration at 6 p.m. Friday, Feb. 5, in the Lewiston Public Library’s Marsden Hartley Cultural Center, 200 Lisbon St. The event is co-sponsored by the Alonzo Garcelon Society and is free and open to the public. The event, now in its fifth year, features performances from a diverse array of groups including Bates students and members of the Lewiston-Auburn community. Light refreshments and hors d’oeuvres will be served. For more information, contact Harward Center events coordinator Brenda Pelletier at this bpelleti@bates.edu or 207-786-6400. Artists in different media including music and spoken word are scheduled to perform. From Bates, the Deansmen, an a cappella group, and the Bates Step Team, a dance ensemble, will participate. The event will also feature students from the Androscoggin Valley Education Collaborative (AVEC) Writing Program and the Hillview Aspirations program as well as a performance by the Bald Hill Trio. 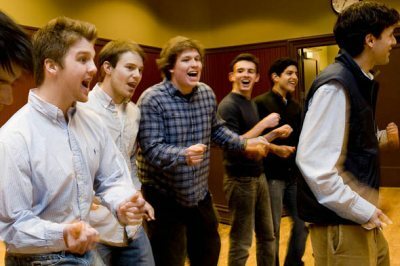 The Deansmen are a 12-voice all-male group and the oldest a cappella ensemble at Bates. Their albums include the independently distributed A Century Half Full (2007), Schlage (2004) and Vocal Syllogism (2001). Now in its 57th year, the group has performed at functions for the Boston Celtics, former U.S. President George Bush Sr., Rockapella and at other events in the Lewiston-Auburn area and around New England. The Bald Hill Trio features Ben DeTroy on mandolin, fiddle and guitar, Mike Conant on guitar and Tim Clough on double bass. DeTroy, a lifelong musician, in recent years has performed with a New Gloucester-based band of eclectic musicians known as Mountain Avenue. Also a member of Mountain Avenue, Conant has played guitar since his youth, and the last two years has focused on fiddle and banjo. DeTroy and Conant back up their two teenage daughters in a band called Chasini Shane. Clough took his first electric bass lesson in the early 2000s and soon found himself drawn to the acoustic double bass. He also performs with a jazz band known as the Three Point Trio. Students from Lewiston and Edward Little high schools will read poetry and stories they have written with the AVEC Writing Program, and girls in the Hillview Girls Aspirations Program will showcase projects including sewing and art pieces. The Hillview program is in its third year of working with middle-school Somali girls. They meet weekly with an AmericCorps/VISTA staffer based at Lewiston Housing Authority’s Hillview Family Development and participate in activities like sewing, community service projects, visioning and goal setting, and skill building to help them to develop assets that support future success. The Harward Center leads Bates’ efforts in community involvement, including programs in community-based learning, community volunteerism and environmental stewardship. The center works with community partners to meet community needs and, in the process, to integrate civic engagement with the Bates educational experience. Learn more about the Harward Center for Community Partnerships. The Garcelon Society is a community organization that raises support for the Androscoggin Scholarship Endowment at Bates, established in 2004 to increase financial support for the college’s students from Lewiston, Auburn and surrounding Androscoggin County communities.